Elise Kavanagh failed to prevent the Breaking, and now Hell is spilling onto Earth. Now she's delved deep into the City of Dis in an attempt to stop the infernal armies--but even the legendary Godslayer is unprepared to face Dis's fiercest demons, not to mention the responsibility of liberating the humans they've enslaved. On Earth, rogue angel Nash Adamson is wing-deep in damage control after the Breaking, and his fellow angels don't want to get involved. War is approaching the werewolf sanctuary. If Heaven won't help them, he'll have to turn to Hell for salvation. Throughly enjoying every book in this series. 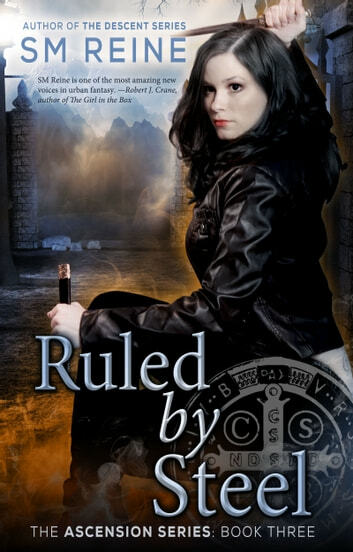 Just like all her other books, SM Reine did an amazing job with this one. I love this artist and this series.